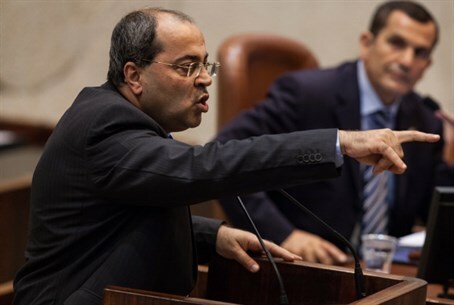 MK Ahmed Tibi (United Arab List) insists that Hamas is not a terror organization, fifteen days after two Hamas terrorists kidnapped three Israeli teenagers and in the midst of a rain of rocket fire on Israel from the Hamas-enclave Gaza. Tibi provided an interview to Hamas's Palestine magazine Friday, where he alleged that the organization is "not a terror organization." The MK also called Prime Minister Binyamin Netanyahu's calls on PA Chairman Mahmoud Abbas to dissolve the unity government "hutzpah (insolent)." That call came after the IDF announced the identities of two Hamas terrorists behind the kidnapping on Thursday. Making Tibi's statements more meaningful is the fact that he currently holds the post of Deputy Chairperson of the Knesset, a position he has been accused of abusing. Tibi's remarks are reminiscent of those of MK Hanin Zoabi, who alleged last week that the Hamas terrorists responsible for the abduction "are not terrorists," and that the kidnapping is a "last resort" for Palestinian Arabs frustrated by their lives. A series of legal actions have been initiated against Zoabi for the remarks, with several ministers and MKs arguing that the remarks are a breach of laws banning Knesset members from identifying with terrorists or inciting against Israel. Zoabi has remained defiant, however, claiming "I did not break any laws. On the contrary - I am fulfilling my moral, human and political duty, the obligation for which I was sent to the Knesset: to fight oppression, and for justice."